You can import from all source files in a complete directory structure. This process enables you to import or synchronize multiple files in a directory tree in one pass. Enterprise Architect creates the necessary packages and diagrams during the import process. In the Project Browser, right-click on the target package for the import. 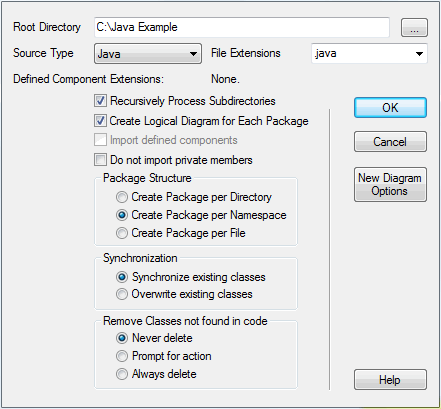 From the context menu, select the Code Engineering | Import Source Directory menu option. The Import Source Directory dialog displays. What is shown on diagrams created by the import.